The SV-100 Sealed Viscometer is a revolutionary, efficient, viscometer. 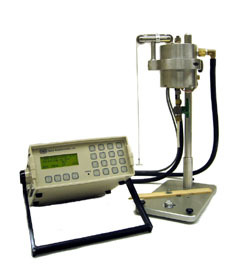 The SV-100 is simple to use and accurate to measure the viscosity of Newtonian and non-Newtonian fluids under sealed and pressurized condition. The SV-100 is perfect instrument for volatile samples. The SV-100 combines economy, ease of operation, accuracy, reliability, and versatility. High quality of instrument guarantees reliable performance for a long life. The new SV-100 Viscometer consists of a viscometer main body with sealed measuring chamber and temperature control water jacket. The viscosity of the sample is determined by measuring the falling time of a needle through a predetermined distance within the fluids held in the sealed chamber. The falling time is measured automatically by means of Hall sensors and a magnet in the needle. For Non-Newtonian fluid, a computer program is available from SBS. Adhesives, Aerosols, Automobile Fluids (Coolant, Engine Oil), Biomaterials, Coal Slurries, Coatings, Colloids, Cosmetics, Creams, Dairy Products, Detergents, De-/Anti-icing Fluids, Dispersions, Emulsions, Fertilizers, Foams, Fuels, Gels, Grease, Honey, Inks, Ketchup, Latex, Lubricants, Mayonnaise, Milk, Oils, Ointments, Paints, Petroleum, Polymers, Proteins, Pulp, Resins, Shampoos, Slurries, Soaps, Solutions, Surfactants, Suspensions, Varnish and many more. For questions or comments about this WWW site, send an e-mail to our webmaster.